Exploring ways to provide context for up-front consent requests during on-boarding, gives a great opportunity to enable people to become more involved with their data and privacy management. Can privacy settings become as transparent up-front as they are on-demand? Many everyday technologies rely on personal data to operate. Managing that data can be a frustrating and confusing experience, undermining people's sense of control. Shedding new light on cookies means giving people meaningful trust, transparency and control, while also explaining the requirements of ad-supported services. 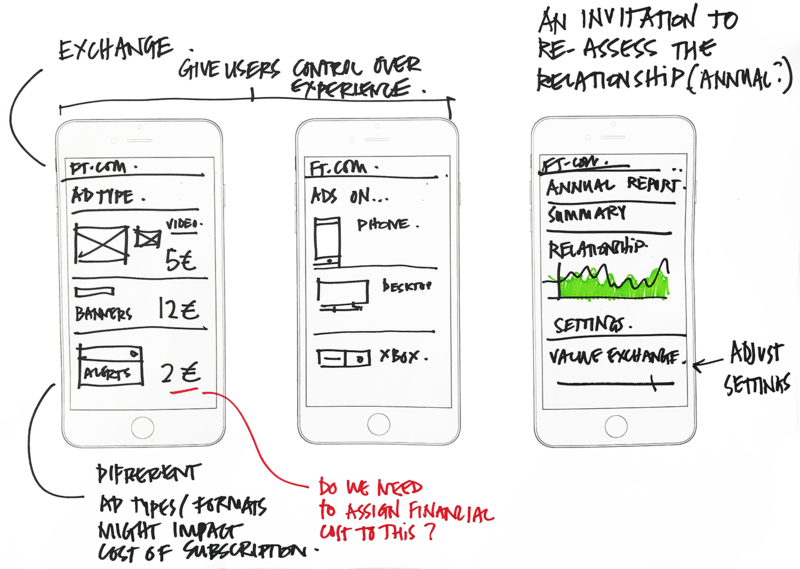 ...give people choices about how their data is processed. Allow people to monetize it? 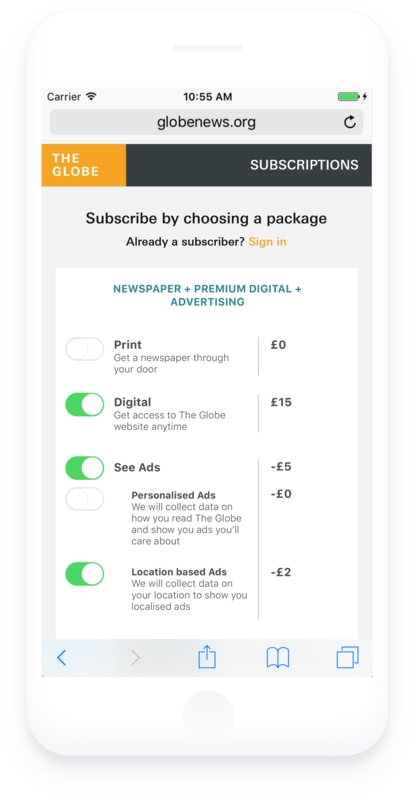 When subscribing to The Globe for the first time, people are offered options to control how their data is used, with the impact of their choice on the overall membership cost clearly explained. The way in which a free subscription level is supported by targeted advertising, with the aid of cookies, is made clear through the interface, as is the fact that turning on targeted advertising instantly applies a discount to membership fees. Giving full cookie-tracking control allows people to see how their data is used, as well as the overall benefits at a glance. See Ads - £5 discount in subscription charge is applied for accepting ads. All buttons are given equal prominence through consistent design. Giving or withdrawing consent are therefore equally easy to do. Rather than being nudged in a certain direction, people are trusted to choose what options suit them best.